سواءً كنت مسافراً بغرض السياحة أو العمل, Marina Resort هو خيار عظيم للإقامة خلال زيارتك بورت ستيفنس. إن موقعه الجيد الذي يبعد 2 km فقط عن مركز المدينة يساعد النزلاء على الاستمتاع بمعالم المدينة ونشاطاتها. يوفر الفندق بفضل موقعة الجيد وصولاً سهلاً إلى أهم معالم المدينة.
. إن Marina Resort حريص على توفير الراحة للنزلاء، فلا يوفر الموظفون جهداً في تقديم أفضل الخدمات وضمان حسن الاستقبال. يقدم الفندق واي فاي مجاني في جميع الغرف, مرافق مخصصة لذوي الاحتياجات الخاصة, تخزين الأمتعة, واي فاي في المناطق العامة, صف السيارات لضمان الراحة القصوى لضيوفه. تنعكس أجواء Marina Resort في غرف الضيوف.اتصال لاسلكي بالإنترنت, غرف لغير المدخنين, مكيف هواء, تدفئة, مكتب هي بعض الميزات الموجود في العديد من الغرف. يقدم الفندق مجموعة واسعة من وسائل الراحة المتنوعة، كمثل: ساونا, حمام سباحة خارجي, سبا, مسبح (للأطفال), حديقة. مهما كانت أسبابك لزيارة بورت ستيفنس، فإن Marina Resort هو الخيار الأفضل لإقامة مثيرة وممتعة. This hotel is in a great location with view over the marina. It's an older hotel and no frills rooms but if you are looking for a hotel near the action with great views at a good price this is a good option. The bed and sheets were very comfortable. Food in the restaurant was good and there was a cheap buffet breakfast with all you need, $16 for that which great for the price! Thank you for taking the time to leave us your review. The hotel is older in style, but it is clean and superbly located as you mention. Our chef's evening meals always receive positive mention and we're lucky to have him here in our restaurant .We are glad that your stay was comfortable and hope you will return some time. The hotel located at the very good location near to Nelson Bay, room is huge and beds are clean. One of the best value hotel to my opinion. Although the facilities a bit old but I think this is just a very small down side. Hotel exterior looks old but it is not really "OLD", the building exterior wall was constructed with the natural red color bricks and therefore I guess this is the reason it looks old from the picture. Thank you for your encouraging feedback. You are correct in saying the exposed brick gives the building an older style look, but the whole hotel has more recently had an overhaul with new beds, air-conditioners, upgraded bathrooms, new televisions, etc. The hotel has a more retro appeal rather than an ultra modern approach, but everything is clean and well maintained. Guests report having comfortable stays here. Upon arrival we were professionally and warmly greeted. The location is perfect with all you need within walking distance. The rooms a spacious with comfortable beds and working conveniences such as fridge, microwave and tv. Bathroom is tidy with great water pressure in the shower. There is a pool and spa, but really its only if you're not experiencing good weather otherwise, the bay has four great beaches in strolling distance. Venture a little further and nature walks and surfy beaches await. The place is great, the people are wonderful, Marina resort even offers a hard to beat value for money brekky. We found this place exceptionally clean, wonderful friendly and kind staff. Couldn't do enough to make our stay more comfortable. It was a quick visit though we would love to come back and defiantly stay here again. Thank you so much for your lovely comments. 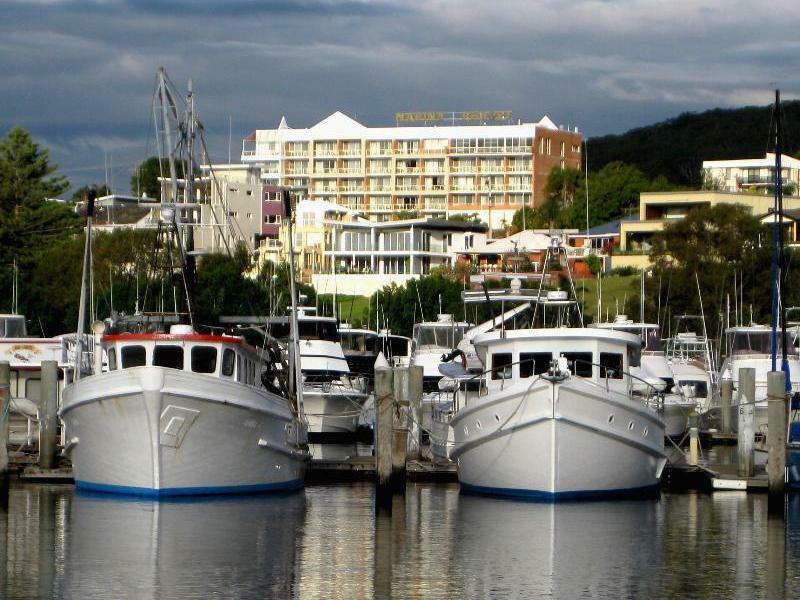 We would love to have you stay with us again in Nelson Bay. Enjoyed my stay here. Large room which included an outdoor area. Staff friendly. Although i had a car, was only a short walk to town centre and marina. Large parking area. Didnt use the pool as it was cold but it looked good and clean. Wifi worked well. Thank you Susan for your positive comments. We are glad you enjoyed your stay. We do have decent sized rooms at the Marina Resort and we are lucky to have the great location with great views from the upper levels, yet close to the town and activities. Please come and stay with us again. A spacious room with a lovely water view. We are very lucky to have such a great location and you're right, our rooms are a decent size by comparison to other hotels. Thanks for staying with us. Friendly staffs. Located nearby to housing area. Just 2-3 blocks away from D'Abola Marina. It is not a new hotel but free parking is provided. A small swimming pool at the front of the hotel. Buffet Breakfast set at the 4th flr with overlooking at Abola Marina. Breakfast at AUD16/pax is worth to try. Will definitely come back again. I spent one night in the ground floor. It still gets some waterview. The room is big with one double and two single beds. It is good value for such a quality room. The only thing is the air conditioner is a bit too noisy. Thank you for leaving your encouraging rating and your lovely comment. Please come and stay with us again. We selected the Marina Resort for the position and excellent reviews. This is an expertly run resort and the staff could not have been kinder or more attentive. The room was really delightful on the ground floor and quite private with an excellent view. Attended the 4th Floor Restaurant on the night we arrived (it is normally closed) by staff invitation as a Bus Group was dining at the Buffet. A delightful meal provided. I would thoroughly recommend this establishment for all travellers from near or far. You'll be very happy. Thank you Brian for your positive comments. It was a pleasure to have such lovely guests as yourselves staying with us and we hope you will stay with us again in the future. We are glad you were able to enjoy the restaurant with our visiting group.Our chef prepares wonderful meals and we are lucky to have him here at the Marina Resort. At this time of year, Nelson Bay is a nice, quiet location and is a great place to relax, but there is still plenty to do, like dolphin and whale watching, great coastal walks, sand dune and many other activities. We are so happy you were able to come and enjoy the place. Kind regards, Marina Resort Staff. Thank you for your comments Sukmita. Tim is our Operations Manager. He is a lovely man is always helpful when guests are in need. We're glad you enjoyed your stay and hope you will visit us in Nelson Bay again. Looks old from the outside but the rooms are nice and spacious. Buffet breakfast for $16.00 per person was nice so was the dinner in the 4th floor restaurant. Nice pool and plenty of parking in a very central location. Can't fault it! This place is nothing fancy but was comfortable, clean with friendly staff, good for a weekend getaway. Thank you for taking the time to leave your feedback. We hope you enjoyed your stay. We're not ultra modern in style, but you're right, it is comfortable and reasonably priced by comparison to others for a short weekend stay. Thanks for leaving feedback. We're glad you were happy with your stay and hope you will come back. We are grateful for you taking the time to comment and your encouraging ratings. We truly hope you had a fabulous stay and would love you to visit us again. Our room overlooked the harbour. It was big enough to comfortably fit 3 people. The pool was lovely. The staff were great. Would stay again, no questions. Great location, comfortable, very clean. Thank you for your positive comments. We hope we may welcome you back again. Great location, awesome views, comfy bed! Little bit over priced but we did book last minute so to be expected. Would stay again! Thank you for taking the time to comment. We do have one of the best locations in the bay and we're glad you enjoyed it. Like every similar hotel in the area, our rates do go up in the high season, but we try to keep our pricing reasonable and to competitive by comparison to the others at these times of year. Very convenient very close to the town centre and Nelson bay. Waterview is nice. Thank you for staying with us. We would love you to stay with us again.